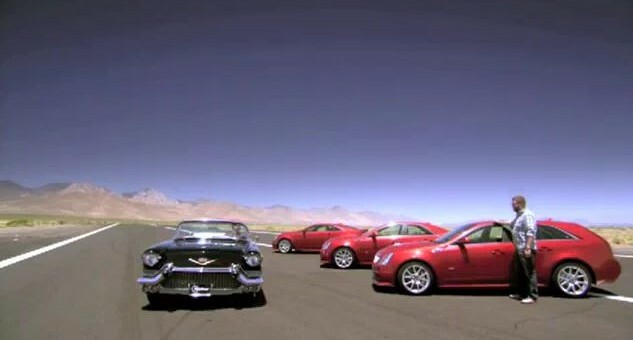 In case you missed it over the weekend, The History Channel’s Top Gear got the chance to play with Cadillac’s finest. Oh, and the Wagon drag races a Ferrari California. The verdict? Watch and find out! On a side note, somebody should have told Rutlugde Wood that there’s a slight difference between the 638 horspower supercharged 6.2L V8 in the ZR1 and the 556 horsepower supercharged 6.2L V8 in the Caddy. And the 0 – 60 is 3.9 seconds in the Coupe and sedan, 4.0 seconds in the Sportwagon. LOL look at 1:32 and pause! As well as the engine not being a zr1 engine he also got the top speed drastically wrong. He said 175mph and I think caddy says 191 mph. How could this show mess up so badly on 2 major points? Especially as they label RW as the “expert”. High-budget footage, though. The Cadillac CTS-V Coupe And Wagon | GM Authority. 😛 And, if you are writing on additional online sites, I’d like to keep up with everything fresh you have to post. Could you post a list of every one of your social community pages like your twitter feed, Facebook page or linkedin profile?